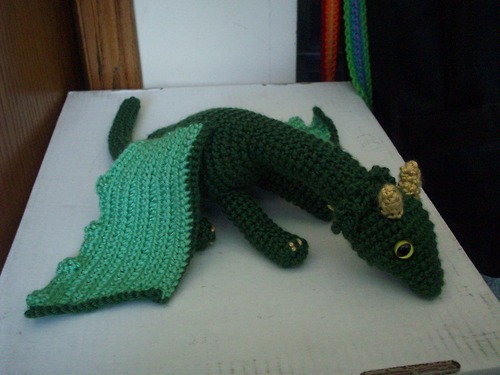 A fan on Tumblr is selling crocheted dragons, and she said she designed the green one to look like my Dragon/Rivka’s dragon. This entry was posted in Uncategorized and tagged amigurumi, crafting, crochet, Dragon, dragons, green, kids, plushie, plushy, toy, toys, yarn. Bookmark the permalink. This is adorable, and I could TOTALLY live without the surprises 😛 Just sayin’. This would also be cool as a hat. So PS I’m home now and Mom has a Kobo so guess what I’m doing July 2nd? Oh, awesome! Well, stay tuned! I’m very excited.